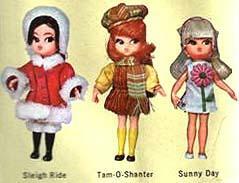 Hasbro sold and distributed the Dolly Darlings dolls in the USA during the mid-1960s, they had a licensing agreement with the Palitoy Company in England, to manufacture and distribute these same dolls. While some dolls are found to be the exact same doll as sold in the USA, collectors have found a hand full that are exclusive to the UK market. We have found no books or documentation for this, but see for yourself in the following photos - all gleamed from auctions or sent to us by the owners. 1. Sleigh Ride - brunette hair, pink coat with faux fur trim, white painted stockings & black painted boots. 2. Tam O' Shanter - auburn hair, tan dress, blouse, scarf and tam, black painted shoes & yellow knee-hi socks. 3. Sunny Day, platinum blonde hair, white dress, with pink daisy flower appliqué and matching head scarf, bare legs with white painted shoes. 4. 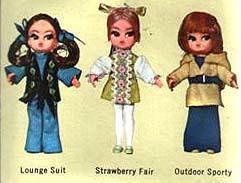 Lounge Suit, brunette pigtail hair with blue ribbons, blue jumpsuit, blue vest with trim. 5. Strawberry Fair - green dress with green painted shoes & white painted stockings. 6. Outdoor Sporty, auburn hair, yellow coat and navy belt, navy slack outfit. Above back of box scans are courtesy of Cyndi Pote, and thanks for sharing these dolls official names! Pink coat with white faux fur trim, bare legs & white painted shoes. Note the difference from the one on back of the above box. Similar to Hasbro's 8532 Powder Puff. Tan corduroy jumper with yellow blouse, tan plaid scarf & tam (not shown), either all painted yellow legs & shoes or knee-hi yellow painted socks & black shoes. Note difference from doll on back of box shown above. Similar to Hasbro's 8544 Lemon Drop. 3. Sunny Day, white summer dress, bare legs and looks like white painted shoes. Doll is the same as Hasbro's USA "8542 Sunny Days" doll. 4. Lounge Suit, blue jumpsuit, navy vest with trim, blue painted shoes. Similar to Hasbro's 8541 Slick Set. 5. Strawberry Fair, green dress with floral trim & white sleeves, white painted legs & green shoes. Similar to Hasbro's 8534 Sugar n Spice. 6. Outdoor Sporty, navy jumpsuit, yellow coat, (belt navy - not shown) blue painted shoes. Similar to Hasbro's 8542 Boy Trap #2.